Gershwin's compositions spanned both popular and classical genres, and his most popular melodies are widely known. Among his best-known works are the orchestral compositions Rhapsody in Blue (1924) and An American in Paris (1928) as well as the opera Porgy and Bess (1935). Initially a commercial failure, Porgy and Bess is now considered one of the most important American operas of the twentieth century. 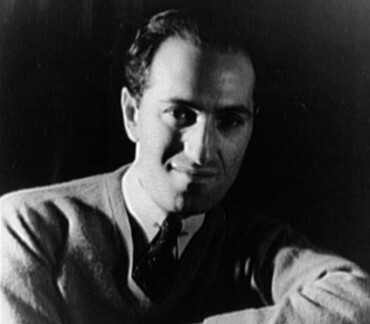 Gershwin's compositions have been adapted for use in many films and for television, and several became jazz standards recorded in many variations. Many celebrated singers and musicians have covered his songs. Komponist, Pianist und Dirigent (1898–1937). 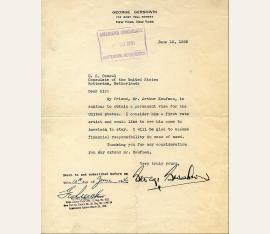 Typed letter signed Wohl New York. ¾ S. 4to. 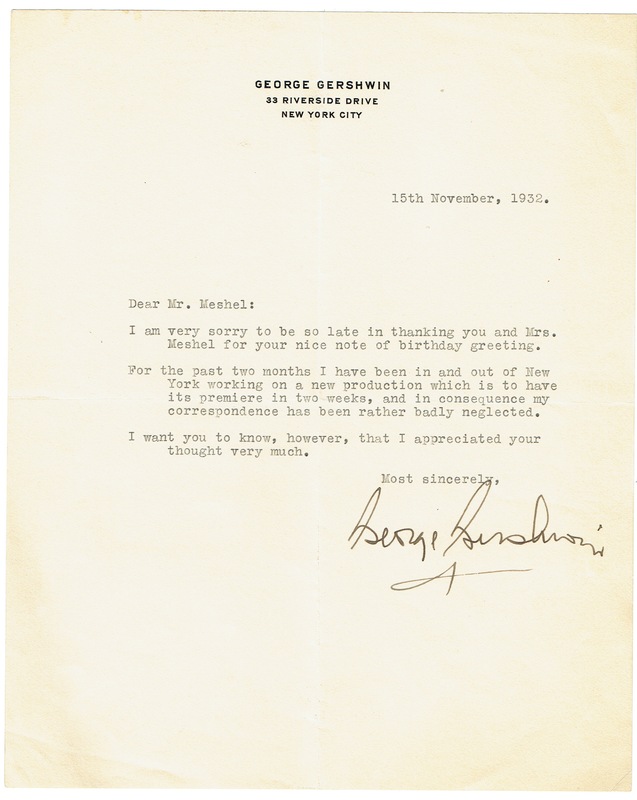 To Irving E. Meshel, sending thanks for a birthday greeting and apologizing for the delay due to having been busy with a new production: „[...] For the past two months I have been in and out of New York working on a new production [probably „Cuban Overture or Pardon My English“] which is to have its premiere in two weeks [...]“. 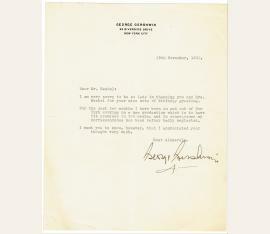 – On stationery with printed letterhead; in perfect condition. Komponist, Pianist und Dirigent (1898-1937). Typed letter signed (carbon copy). New York. 1 S. 4to. 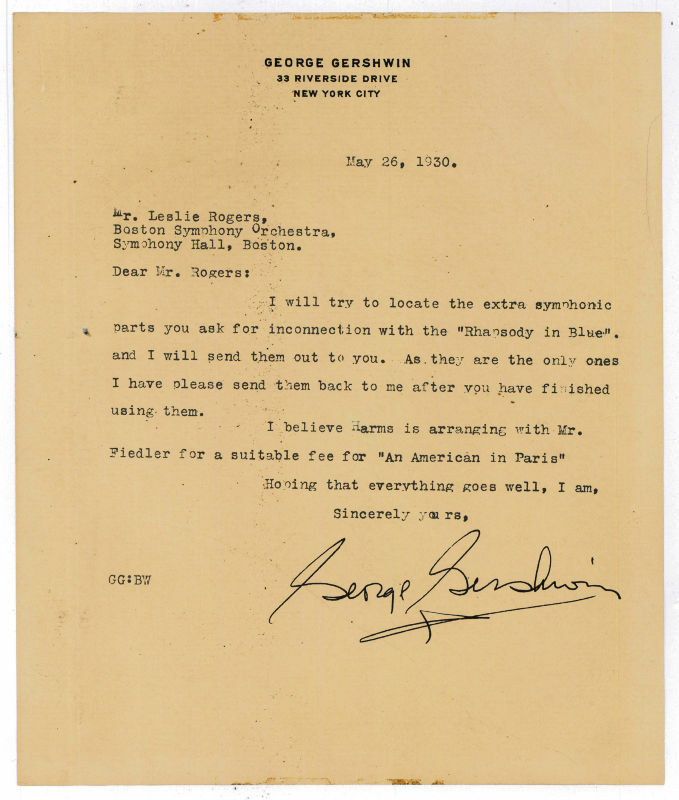 To Leslie Rogers of the Boston Symphony Orchestra: "I will try to locate the extra symphonic parts you ask for in connection with the 'Rhapsody in Blue' and I will send them out to you. As they are the only ones I have please send them back to me after you have finished using them. I believe Harms is arranging with Mr. Fiedler for a suitable fee for 'An American in Paris' [...]". - On stationery with printed letterhead. Some wear and traces of mounting on reverse, but still well-preserved. Komponist, Pianist und Dirigent (1898-1937). 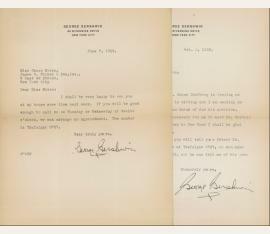 2 typed letters signed. Wohl New York. Zusammen (¾+1 =) 1¾ SS. auf 2 Bll. 4to. 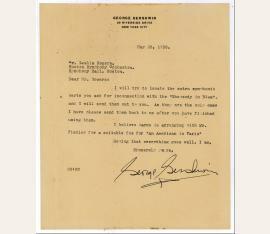 To Grace Morse of James B. Pinkerton & Son, concerning an invitation (7 June), and sending biographical material: "Mr. Isaac Goldberg is keeping me posted about what he is writing and I am sending as much material as I can think of for his articles. If you think it is necessary for me to meet Mr. Costain when Mr. Goldberg comes to New York I shall be glad to be at the meeting [...]" (2 Oct.). 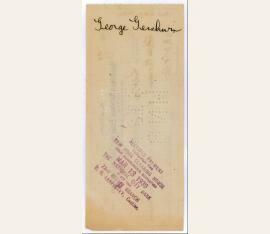 - On Gershwin's personalized stationery engraved at head "George Gershwin 33 Riverside Drive, New York City"; marginal splits to center horizontal folds; small damage to edges and slightly browned due to paper. Komponist, Pianist und Dirigent (1898-1937). Checque, endorsed on reverse. New York. 70:163 mm. Mit einer Beilage (s. u.). Issued by Grace Morse from James B. Pinkerton & Son to pay to the order of Gershwin the amount of $3,375. 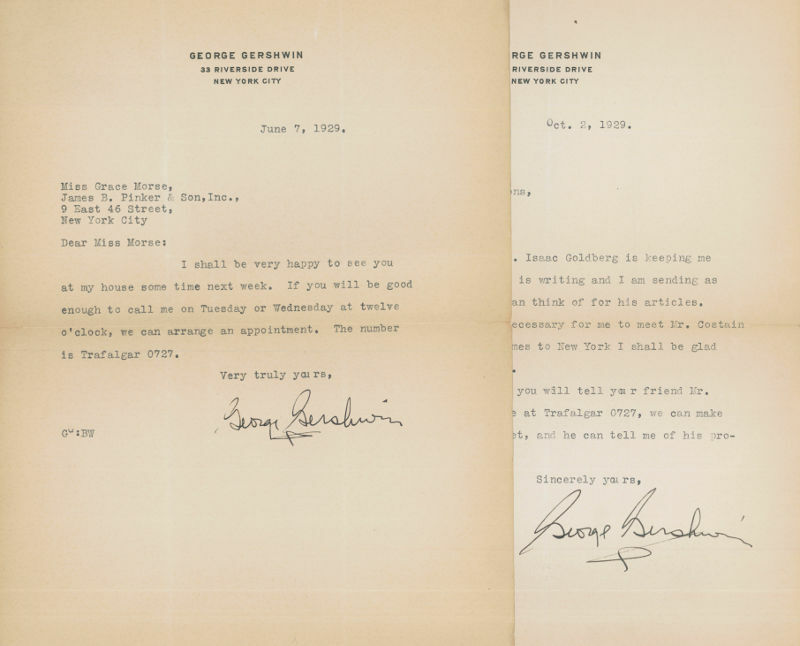 Together with a check from the same issuer to pay the same amount to Gershwin's biographer, Isaac Goldberg (also endorsed on verso). To the US consulate in Rotterdam, vouching for the painter Arthur Kaufmann (1888-1971), who had to flee from Germany: „My friend, Mr. Arthur Kaufman, is anxious to obtain a permanent visa for the United States. I consider him a first rate artist and would like to see him come to America to stay. I will be glad to assume financial responsibility in case of need [...]“. – Arthur Kaufmann emigrated to the USA the same year. – On stationary with printed letterhead; with certification note and receipt stamp of the consulate. – Slightly browned and stained. Eigenh. Widmung mit Notenzeile und U. in: Isaac Goldberg: George Gershwin: A Study in American Music. Four bars from an unidentified work dedicated to Grace Morse: ""All the best George Gershwin Nov. 8, 1932". - Front spine broken, binding somewhat bumped; wrapper with larger defects. 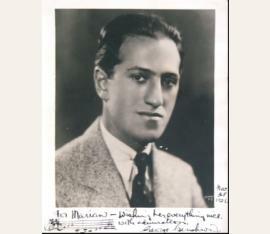 George Gershwin (1898–1937), American composer. Portrait photograph with autogr. 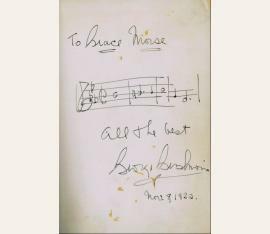 dedication and musical quotation signed. N. p., 25 Nov. 1931. 20 x 25 cm. Head-and-shoulders photograph of the young composer. With three bars from “Rhapsody in Blue”. Dedication: “For Marian – Wishing her everything nice. With admiration. George Gershwin”. Matted. Insignificant traces of wear. Very rare thus.